A close look at The Printed Word who is the UK's first 52DI ECO-UV customer. TPW is enjoying instant print drying and enhanced turnaround time. They no longer need to seal jobs prior to finishing on silk stocks. 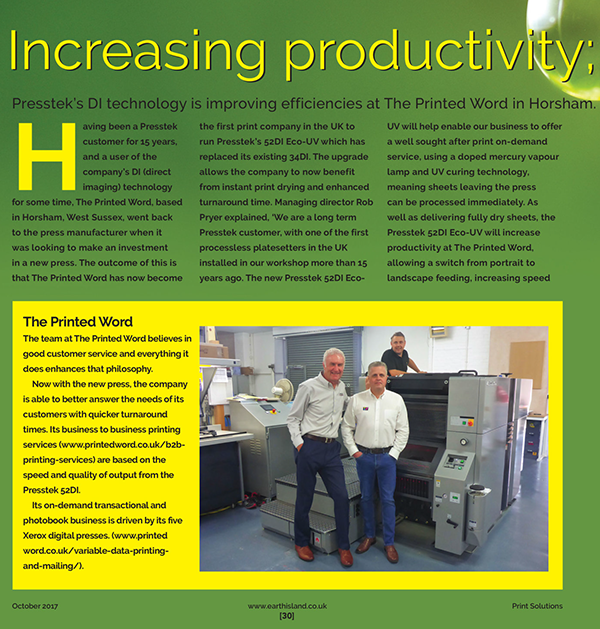 An interview with Presstek 52DI-AC customer Washington Direct Mail in Gateshead, UK. The 52DI-AC is a 4-color DI with integrated aqueous coating. 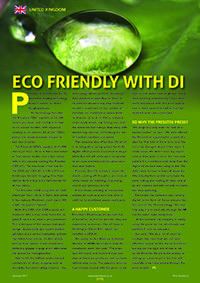 Includes a synopsis of Presstek's eco-friendly DI press models. This in-plant expects to save big on click charges for its high volume of full color newsletters. They also expect to bring in other work previously outsourced. With their DI, less set-up and production time is needed, plus they can run a wider range of substrates. RND Signs, lawn care sign specialist is featured in this short article. 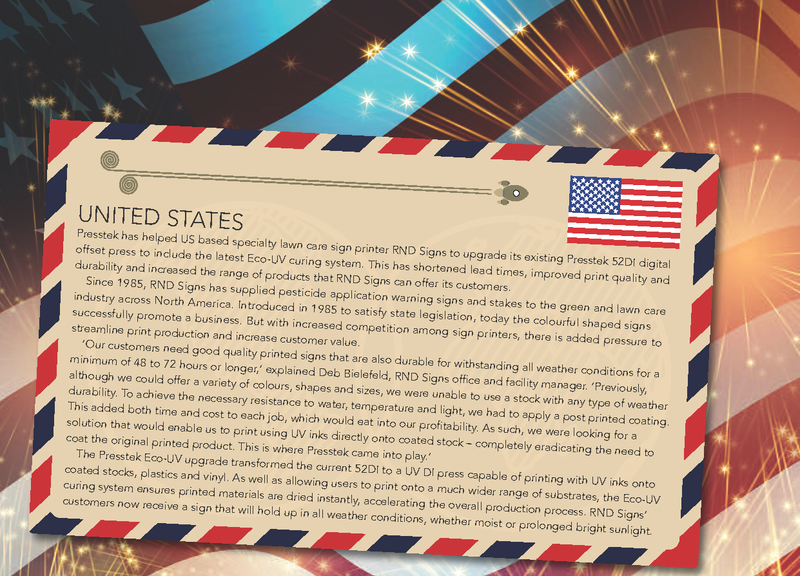 RND Signs uses their 52DI ECO-UV press to accomplish easily printing on coated stocks, plastics and vinyl. At the Print Show, Presstek shows its 52DI with doped mercury UV lamp technology. Results in faster job production overall and a printer can expand their print portfolio from just traditional paper & board to vinyl & plastics. 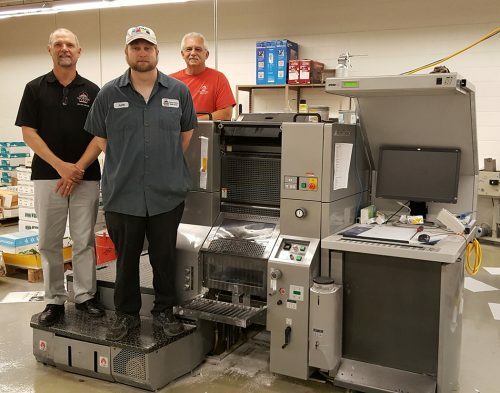 VSU installed a 4-color 34DI - Manager Drew Burgering feels it was one of the best decisions the shop has ever made. VSU cites increased revenue, keeping work in house, ease of printing & high quality color and more. Well known in the Bordeaux area for high quality wine labels, Print Dorure are very happy to have eliminated chemistry from their platemaking process. 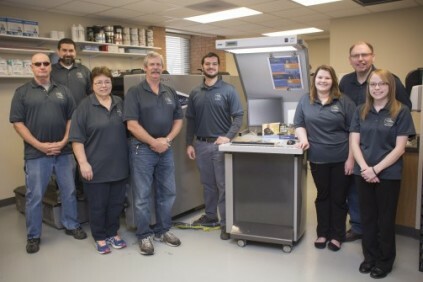 In this article, Abbotsgate shares that their CPO DI produces high quality print far superior to their conventional presses in half the time with minimal operator intervention. This shop rejoiced when their CPO 34DI was delivered. No longer would they have to run 4-color work on a 2-color press. Deadlines are no longer a problem, either at this in-plant shop. The college's entry-level 34E-DI has increased volume and image quality.